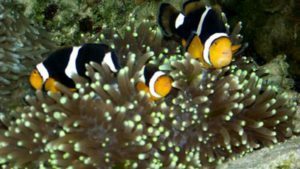 The head of their group is the Mother Clownfish who is the eldest and gives babies. Next to her comes the Father Clownfish, her companion. Mother Clownfish lays hundreds to thousands of eggs in the home anemone. Father Clownifish watches and takes care of the eggs. If the Mother Clownfish dies, the Father Clownfish changes from male to female and becomes the mother! Who becomes the Father then? The second eldest member of the group becomes the Father. Even if it is female, she changes to male and becomes the Father! The father clownfish cares for the babies. When babies grow up, they join a new group in another anemone. Male clownfish often fight with each other. Age is a very important thing in their group. Older clownfish boss over the younger ones. 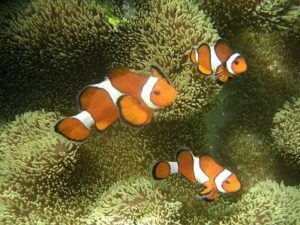 We know Clownfish as a friend of the Sea Anemone. There is an another good friend of the Sea Anemone we must know about.